Custom designed Caribbean Rosewood earcups. Specially designed premium lamb skin leather earpads. Diaphragm excursion of 2.5 mm p-p for very high SPL. Maximum output exceeds 130 dB. 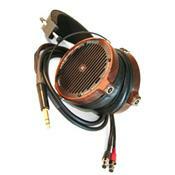 Left and rear transducers have matched sensitivity and frequency response within +/- 0.5 dB. Specially designed self closing, acoustically transparent magnetic structure with highest grade Neodymium magnets. Large diaphragm area creates plane sound waves that enter ear canals the same way as it happens in real environment. Frequency Response: 5 Hz - 20 KHz, usable high frequency extension 50 KHz. Distortion: less than 1% even at full output. Transducer active diaphragm area: 6.17 square inches. Weight: 550 g, without cable. 2) slightly grainy, forward treble, lacks some delicacy. Review made using the phono stage of an aging Audiolab 8000C with the stock cables that ship with the Audeze unit. Highly recommended headphones for the serious listener - in every department other than treble delicacy they beat my 23 year old pair of Sennheiser HD540 gold reference headphones.